Studio Tupi #3 begins with all the joy that a sunny Sunday can bring, especially a spring one. Barbecue out and picanha filet seasoned, we were ready to welcome Mr. Jason Sanders A.K.A General Eclectic. Founding member of Uma Nota & Footprints, two great music projects in Toronto, General Eclectic is an (as his DJ name conveys) eclectic collector and a skilled DJ, not to mention his stunning visual design abilities. 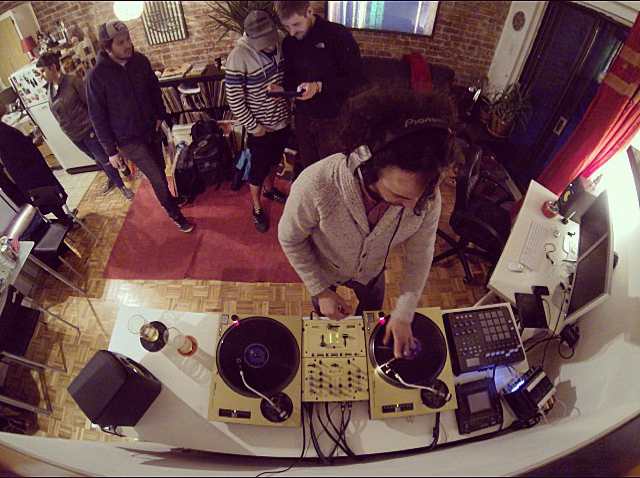 He was in town and we just had to invite him over to drop some Brazilian records at our studio. His selection was as impressive as his beat matching. My biggest discovery was his 45 RPM of Carmen Miranda’s cheezy Chica-Chica-Boom-Chic song interpreted by Rolando Faria & Luiz Antônio. A killer groovy track! He also offered classics like Baden Powell, Tamba Trio, Gilberto Gil, Ed Lincon, Elza Soares and others straight from his original records. Chatting with me, near the barbecue before he started to play, he even told me: “I’ll play some more chill tracks”. Hahaha at the end, maybe inspired by my non-stop dancing neighbour, he made us all shake! We interviewed General Eclectics asking him to tell us a bit more about his relation with Brazilian music, and about his music research and activities. Barbecue, drinks, great friends and amazing Brazilian music. Is there a better combination? 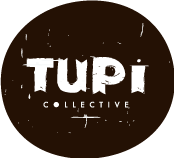 Tupi Collective: Our first question can’t be any other than the classic “How dit you discover and when dis you start loving Brazilian music?”. General Eclectic I first heard Brazilian music back in 1999 on a mix cassette tape by a DJ collective called Movement. They were Toronto’s finest vinyl diggers back then. I remember not knowing how to describe what I was hearing, only that I knew it was the craziest music I’d heard up until that point! I was instantly hooked! Tupi Collective: Is there a song or a Brazilian artist that you like the most? Why? General Eclectic: I’d have to say Jackson do Pandeiro & Jorge Ben. Both are masters of their craft and have contributed an encyclopedia’s worth of music that is so unique and timeless. People will be playing and singing their music in another 100 years! Tupi Collective: Can you tell us a bit about FootPrints and Uma Nota Culture projects? General Eclectic: Foot Prints is my longest running event and one of the longest running in Canada, now in our 13th year. My DJ partner Jason Palma and I play a wide range of music, all of it dance floor focused and mixed with an eye for detail and a respect for the subtle art of djing. We try to expose the best of the vintage and the coolest of the new sounds from around the world. Since day one we’ve been busy and have attracted an amazing crowd of dancers, music heads and open minded friendly people. We’re currently working on a retrospective book filled with photos and my flyer designs starting from 2002 all the way up to now. Uma Nota Culture is a multi-faceted events organization started by myself, Alex Bordokas and Jonathan Rothman back in 2007. We present mainly PanAmerican music and culture with a tropical flair to a broader downtown Toronto audience. We began as a bi-monthly event series, giving equal stage to both live percussion groups and DJs, but have since grown to encompass collaborative projects, live presentations, workshops and a yearly music festival. Along with working on live programming and event concept ideas, I am the creative director and musical face of the brand, DJing at the majority of the events and designing all of the artwork and imagery. My partner Alex Bordokas as Artistic Director has been instrumental in helping the growth of our brand over the years, working with key players in the industry and making connections with like minded companies in South America and the States. As a result of our collective efforts, we have a slew of interesting and cool projects and events lined up for this year and the next, including our annual Block Party, presented in partnership with Luminato, which will take place Saturday, June 27th in downtown Toronto. Tupi Collective: What are your present and future plans? General Eclectic: I’ve been DJing nearly 20 years now and have created or been involved in so many fun and exciting events over those years. Toronto has been really good to me but I feel that I’ve seen pretty much all the city has to offer. Now my goal is to start touring around Canada, the States and abroad more, spreading my unique sounds and skills to rock unsuspecting crowds! I also recently starting playing the drums and am in 2 new music projects, my goal is to incorporate these live music projects into my DJ events more closely, developing a unique live sound and taking them on the road as well. Music is in my family, my dad was a drummer and my mom was a very well known singer from Barbados, I feel like DJing has been a useful stepping stone for me into the world of live music and composition. Tupi Collective: Thank you so much to accept our invitation and for the great afternoon! Can you share where we find more about your many projects and works as Dj and visual designer? General Eclectic:My pleasure! Thanks for having me! You, Marcus and Antoine are a totally cool crew and wicked hosts! You can take a look at my designs by browsing my facebook page https://www.facebook.com/jasonsandersgeneraleclectic . For now I am strictly word of mouth and by recommendation. You can listen to a selection of my DJ mixes at https://www.mixcloud.com/djgeneraleclectic/. You can discover the many facets of Uma Nota Culture at http://www.umanota.ca, we have so many fun and exciting events and collaborative presentations coming up this year! Check the Footprints facebook group https://www.facebook.com/groups/footprintstoronto/ for info on us and our upcoming events!